Preface (D.M. Gabbay, J. Woods). List of Contributors. Leibniz's Logic (W. Lenzen). Kant: From General to Transcendental Logic (M. Tiles). Hegel's Logic (J.W. Burbidge). 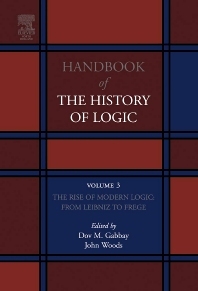 Bolzano as Logician (P. Rusnock, R. George). Husserl's Logic (R. Tieszen). Algebraical Logic 1685-1900 (T. Hailperin). The Algebra of Logic (V.S. Valencia). The Mathematical Turn in Logic (I. Grattan-Guinness). Schröder's Logic (V. Peckhaus). Peirce's Logic (R. Hilpinen). Frege's Logic (P. Sullivan). Index.